Cosmetic Dentistry involves dental treatments, such as teeth whitening, veneers, crowns, dental implants, tooth bonding and Invisalign in a way that improve the appearance and function of the smile with experienced female Brisbane dentist, Dr Leila Haywood. Aesthetic dentistry involves treatments that improve the appearance of the teeth, gums and/or bite. It can improve the the colour, position, shape, size, alignment and overall aesthetics of a smile, following evaluation of factors such as jaw alignment, shape of your teeth, lips, mouth, face and dental photos and models for aesthetic consideration, and optimal function. Teeth whitening removes discolouration from your teeth, for a beautiful and fresh smile. It takes about 90 minutes with Zoom White Speed Teeth whitening technology and technique that comes from a decade or two of experience in cosmetic dentistry. 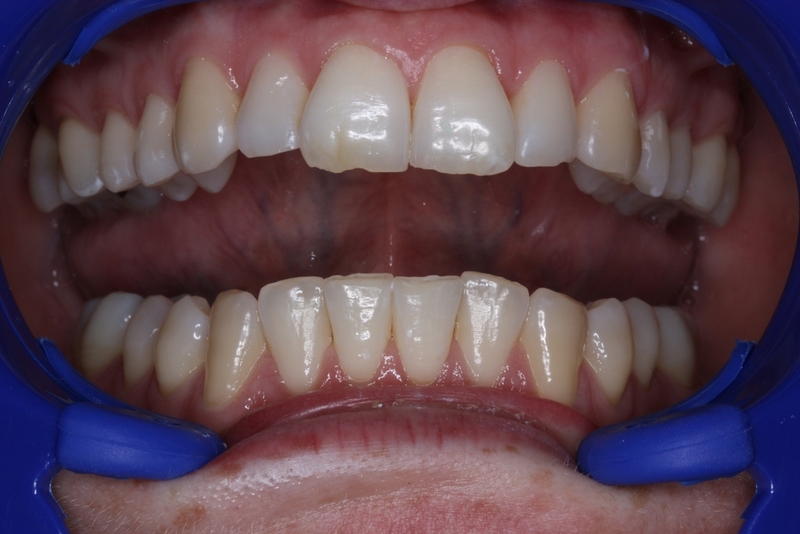 Our dental hygienist, Christine, does the majority of our in office teeth whitening and comes up with some astounding results on a weekly basis. A crown is a precision fit cover that is made precisely with a computer in the laboratory by a ceramic specialist, and that strengthens worn, damaged or broken teeth, and protects the tooth as best as is possible in the bite. They are often used cosmetically, to enhance the size, shape or colour of teeth because of their beautiful stain free and long lasting aesthetics. Primarily they are used to build teeth back together when they are badly damaged. Crowns can vary wildly in quality around the world, depending on the skills, experience and standards of the dental team. Our preferred system for porcelain crowns are those made with the Swiss e.Max porcelain technology, that are all metal free and that can seamlessly and exactly replicate tooth structure, with incredibly strong and long lasting results. The best ceramists are true artists, and make the crowns from study models and photos that we supply to them, and our crowns are made here in Brisbane. Just as with any other tooth, crowned teeth must be flossed around daily, with twice daily toothbrushing, along with 6 monthly preventive dental care with your dental professional. There is natural tooth underneath the crown and it must be cared for. Most ceramists manufacture crowns with a 5 years warranty in Australia. Gold alloy is sometimes used for crowns on the back teeth, albeit rarely, for unbreakable strength on molar teeth, for patients who grind their teeth very heavily. It is extremely difficult to break a porcelain crown, and if this happens we wonder whether a night guard is required to protect the bite against grinding of the teeth during sleep. Zirconia crowns are used in very specific circumstances, where there is severe staining of the underlying tooth structure, and for bridge work when required to be made without metal. Nearly everyone who is missing one or more teeth, and is in good health can be assessed for dental implant treatment. Dental implants can last a lifetime, unlike bridges, partials and dentures which may need to be replaced several times. Invisalign is a series of invisible, removable, and comfortable aligners that are designed to move your teeth by a small amount as they are changed. Patients wear them for 22 hours a day and remove them to eat, drink and clean their teeth. More than 2 million people around the world have used Invisalign as the clear choice for straightening their teeth. Invisalign consists of a series of nearly invisible, removable aligners that you change every week for a new set. Each aligner is individually manufactured for your teeth only. As you replace each aligner, your teeth will move - little by little, week by week - until they have straightened to the final position. Invisalign can be used to treat a wide variety of issues, including overcrowded teeth, widely spaced teeth, cross bites and overbites. These are thin, tooth-coloured porcelain shells which are seamlessly bonded to, the front of prepared teeth. They are a more conservative treatment than a crown and can be used if the tooth is strong and healthy. Generally they are suitable for people who have very misaligned teeth, and who did not wish to have braces or Invisalign. If the teeth are discoloured or very worn, they may be a treatment option. A bridge replaces missing or lost teeth by suspending a false tooth from the natural teeth on either side of the space. A bridge can restore lost teeth, support remaining teeth and help keep your teeth in proper position and bite. is an effective, simple and painless procedure where our dentists can re-shape and re-surface your teeth to match your bite and improve your smile. Tooth re-contouring is usually used when teeth are slightly out of alignment. Tooth bonding is the use of a tooth-coloured plastic adhesive that your dentist will shape and polish to match the surrounding teeth. Dental bonding is relatively painless, and for one tooth takes anywhere from 30 minutes to an hour. When requested in cosmetic dental cases, our dentists are trained in facial injectables, including muscles relaxants and dermal fillers, and will advise if we are able to assist in areas of concern. We will not mention this in forming any dental treatment plan, as a matter of respect to all, however we may be able to assist if requested. These treatments are available for clients over the age of 30 years, and for subtle and natural enhancement of facial features on request. Our dentist has advanced training in facial aesthetics, symmetry, balance, facial proportions.